Skytech was officially founded in 1976, but its roots started a long time before. Skytech’s Founder and Chairman, Frank Stephenson came to work at the Martin Airport – now Martin State Airport – in August of 1959. Back then Martin was a hotbed of aircraft production and the newest technology around. The Martin Company’s Chief Pilot got all out of sorts trying to figure out how to run the new maintenance system that accompanied their ultra-modern Gulfstream G-1. The maintenance was “computerized” and no one in the company had any idea how to use it. So they went looking for someone with experience in automated aircraft maintenance systems. Frank, a 23-year-old Pennsylvania native and fresh out of the Air Force, had been running the Air Force version for about 5 years. What they did not tell Frank was that their other Corporate aircraft were Martin model 202 and 404 Airliners that had been converted from Experimental Flight Test. As such, they had no Standard Airworthiness Certificate and thus no formal maintenance plan. So every time they needed a part Frank had to go into the factory and “requisition” one for the Corporate Flight Department. His only salvation was a badge that showed his Department as 0001 – because there was no such thing as the Corporate Flight Department, only some test pilots with converted airplanes that hauled the Execs around. So resourcefulness at Skytech goes way, way back, and it was a cornerstone of the business when Frank founded Skytech in 1976. With corporate headquarters based in the Martin State tower building, reminders of Skytech’s beginnings are evident to this day. Initially an aircraft parts company, Skytech naturally developed into a maintenance facility as well and set up shop in a corporate hangar which years before was churning out Martin B-26 bombers among other famous aircraft. In 1977 we were recognized as an FAA Certified Repair Station. In January of 1980 a new face appeared at Skytech. John Foster, Skytech’s President, assumed roles in every facet of the business along the way and was instrumental in ushering the next phase of company growth – Aircraft Sales. 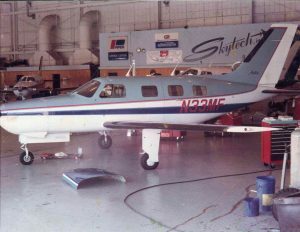 Officially a Cessna Single Engine Dealer in 1978, Skytech added the full Piper Aircraft line as well in 1980. In 1984 a clean sheet airplane was unveiled from Piper’s hangars – the Piper PA46 Malibu. Over 300 PA46 airplane sales later, Skytech is universally recognized as an industry leader with the airplane and was instrumental in the success of the design. 1992 began Skytech’s role as a Cessna Caravan Authorized Sales Representative (ASR), and in 2003 we led the world in sales of the now legendary airplane. Continuing a trend of identifying and associating with advanced game-changing products, Skytech became one of the first Pilatus Aircraft Limited Distributors of the PC-12 in 1993. The PC12 has since gone on to worldwide success. Yet another form of company growth came in 2001 when Skytech opened their first full-service FBO facility in Rock Hill, South Carolina (Charlotte metropolitan area) at the York County Airport (UZA). It was not an auspicious start. We received the Use and Occupancy Permit for a brand new, dedicated maintenance facility in mid-August 2001. Starting slowly and building business over time was something that we had anticipated. We had not anticipated that we’d be challenged with growing an aviation service business without airplanes. Like everyone else in the industry, after September 11 what we had was more like an Aviation Museum than an aviation service business. Exacerbating the situation was the location of our other facility – in Baltimore, squarely under the Washington, DC “no-fly” zone. It was sort of like having a high-tech boat dealership in the middle of the Sahara desert. Nevertheless, we survived and continued to move forward. In 2009, the most dramatic change in Skytech’s history came about because we simply outgrew the Martin State Airport. Skytech moved to the Carroll County Regional Airport (DMW) in the Baltimore-Washington metropolitan area on August 31st. Truth be told, we probably outgrew Martin a decade ago but did not want to admit it. Plus, we wanted to be sure that we had successfully learned how to build and operate a world-class, full-service FBO complex that could concurrently support our aircraft sales and service business. If you have ever visited our Rock Hill campus you know that we are off to a great start. So our next objective is to duplicate – or amplify if we work hard enough – our FBO success in Rock Hill. That effort is personified by our brand new facilities at the Carroll County location. It’s 5,100 runway with WAAS approaches brings you to a new, 22,000 sq. ft. Maintenance and FBO facility dedicated solely to Skytech’s customers – both existing and not yet introduced to us. The same great personalized service that we have given our customers at the Martin State maintenance facility will now include your Line Service experience at DMW. In addition, we will have one of the only dedicated Aircraft Sales showrooms east of the Mississippi River. While we keep an Administrative presence at Martin State, Carroll County is now – from a customer perspective – our Baltimore-area home. The world premiere of the Pilatus PC-24 “Super Versatile Jet” took place at the European Business Aviation Conference and Exposition (EBACE) in Geneva, Switzerland in 2013. Skytech was appointed a dealer for the PC-24 and was on hand for the festivities. The celebration continued the following year in August 2014 for the official roll-out of the first PC-24 prototype. “We always wondered what Pilatus could possibly build next after setting the bar so high [with the PC-12]. And now we know: an airplane that does the same things with an even larger cabin, longer range, and more payload while displaying unheard-of short field performance. And it retains that flat floor and massive cargo door. So here comes the PC-24 – and all the expectations associated with a jet aircraft built with Swiss precision at an airport surrounded by the Alps. This is going to be good.” – John Foster, President of Skytech, Inc.
We celebrated our 40th anniversary in 2016, a huge milestone in itself as we continue to grow! Skytech also officially became an FAA Part 135 Charter Operator to add what could arguably be considered the last piece of the puzzle making Skytech something for everyone in business aviation. Delivery of the much anticipated Pilatus PC-24 officially kicked off at the beginning of 2018. There has been a tremendous amount of excitement over the last several years and the future only appears to be getting brighter!